Mr. Moon's Wild Ride Week 7: Olivia's Grand Trial! Made it out of Diglett's Tunnel in one piece! It was not as large as I anticipated. Maybe the first time I entered the tunnel it was some bad luck, because this time around I ran into a large amount of Digletts. No 20 minute SOS battles because of confuse ray for me! I ran into Team Skull towards the exit but ended up rolling through them. Just to be on the safe side, I spend some time exploring the cave before moving forward. Just like Ten Carat Hill on the first island, a pathway was blocked with a large boulder. Yet another place for me to revist when I get the Ride Pokemon equivalent of Strength! 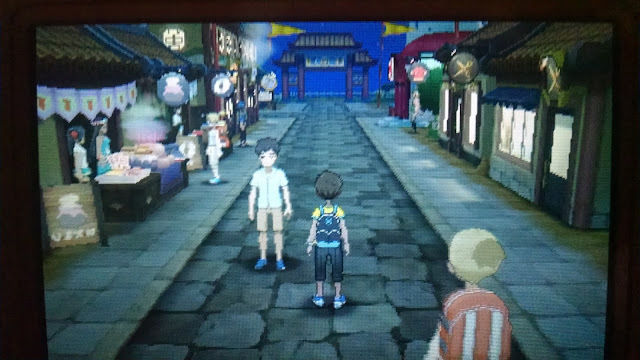 After wandering around Route 9 and exploring Memorial Hill I made it to Konikoni City. The city had an Eastern Asian style to it which was nice considering Chinese/Lunar New Year had just passed during my playthrough. On the right side of the city there's a hair salon and clothing shop! I feel my style is getting stale but I'm spending all my money on supplies. I'll have to get serious about using the Poke Pelago to boost my funds until I find something similar to X/Y's restaurants. Ignoring how broke I am, I went to Olivia's shop to get the Grand Trial started... but she's not there. 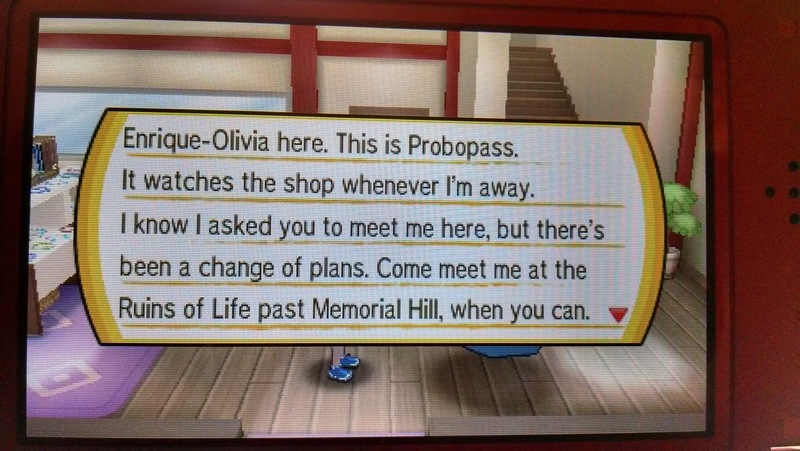 Her Probopass (evolved form of Nosepass?) left me a not telling me to travel through Memorial Hill to the Ruins of Life. Before I headed back to Memorial Hill, I formed my party of anti-Rock Type Pokemon consisting of Grass,Ground and my water starter Pokemon. There were two instances were I regretted this, both while I was on the way to the Ruins of Life. The first came while I was searching for Pokemon in Memorial Hill. I tried (and failed) to capture a Phantump, a Ghost/Grass Pokemon that looks like a ghost with a stump on its head. I looked it up later on but at the time I thought Bug-Type moves were effective against Ghost-Type Pokemon. I was horribly wrong!! The only "off-type" moves I knew in my party were Normal-Type moves(which will not hit Ghost-Types) and Fairy-Type moves. It did not help the Phantumps knew Ingrain(a Grass-Type healing move) and Leech Seed. After struggling for 10-15 minutes against a Phantump that kept finding Pokemon to answer its SOS, I decided it'd be best to run away at every encounter with my current party. I'll be back once the trial is over to get my revenge!! 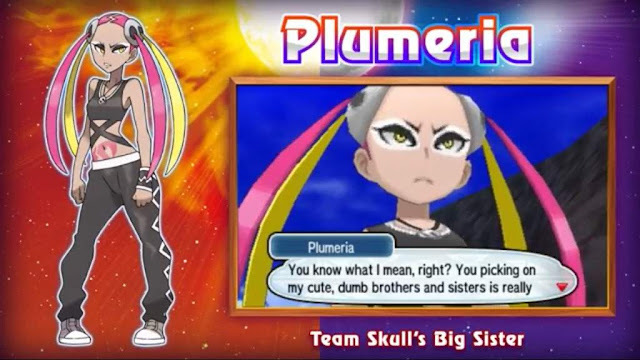 Outside the entrance to the Ruins of Life is where I once again regretting my team composition thanks to Team Skull's Plumeria. Which is fair, I have been kicking the butts of all of Team Skull until now. She swept my whole team with her Golbat! Nothing went my way during our first battle. If my Pokemon weren't knocked out with Air Cutter (Flying-Type move with a high chance to critically hit), I would attack myself in confusion thanks to Confuse Ray. Air Cutter alone was super effective against half of my party while two of my Pokemon could do no damage to Golbat because they knew primarily Ground-Type moves. 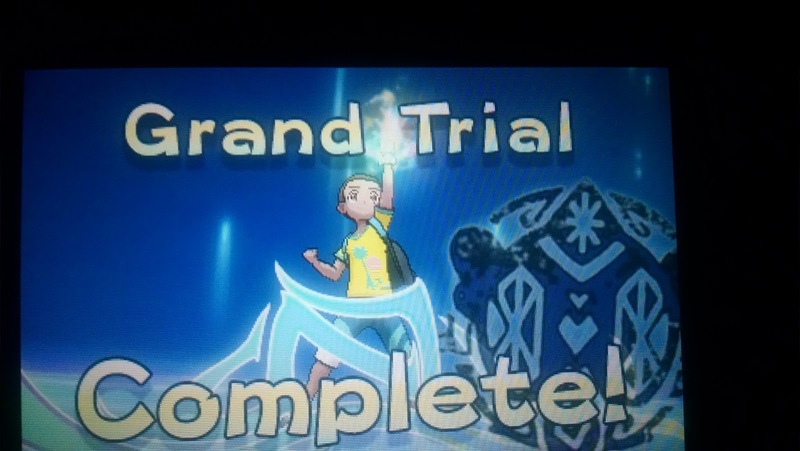 Yep, I was so close to the Grand Trial only to be sent back to the PokeCenter. Whelp, see you next week!... is what I would have said if I didn't happen to train a Magnemite during my travels! She had a Salandit on reserves but my Ground-Type Pokemon made short work of it. Overcoming that ordeal, I made my way to Olivia's Trial and ran into Lillie on the way. She was nice enough to heal my Pokemon... after I used a good amount of potions of top off everyone's HP. I'm really bad at this. Despite having an overwhelming type advantage, Olivia put up quite the fight. I regret not being fast enough to take a picture of Olivia using a Z-Powered Rock move on my Petilil; Olivia's Pokemon summoned a giant boulder and threw it on top of my little Pokemon. My next stop is to visit Hano Grand Resort. 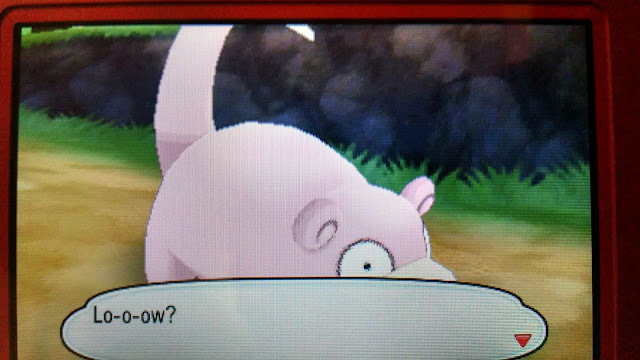 Between Memorial Hill and the Ruins of Life, I ran into members of the Aether Foundation trying to stop Team Skull from stealing a Slowpoke. As thanks for foiling Team Skull, one of the members invited me over as thanks. I hope it's as swanky as the Tide Song Hotel in Heahea City!